Tourism Minister, Edmund Bartlett (left) conversing with Donovan White, Director of Tourism, at a reception for Chile's travel industry hosted by the JTB in Santiago, Chile. Joining them are (left to right): Delano Seiveright, Senior Advisor/Strategist, Ministry of Tourism; Fiona Fennell, Director of Communications, Ministry of Tourism; Donnie Dawson, Deputy Director of Tourism, Sales/USA and Latin America; and two Chilean hostesses for the Jamaica reception. 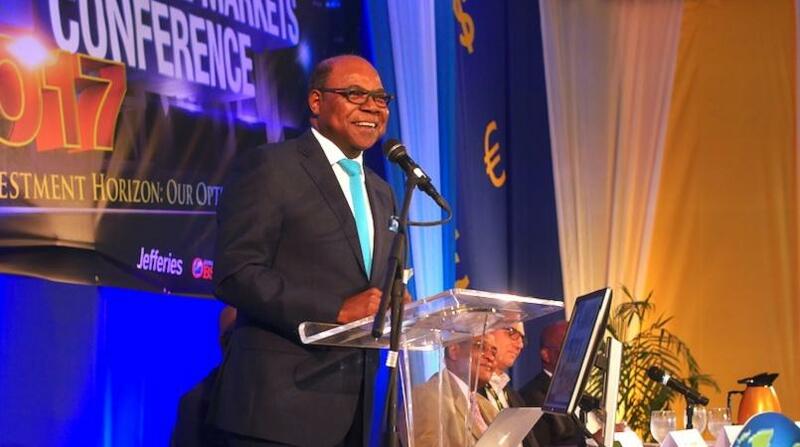 Tourism Minister, Edmund Bartlett, last week announced that one of Latin America’s largest airlines, COPA, will increase to daily its service between Panama City and Montego Bay, starting in July of this year, bringing to eleven the overall number of flights weekly between both countries. Currently, Copa operates four flights into Montego Bay and the same number into Kingston weekly, but as of July will move to seven into Montego Bay and the same four into Kingston weekly. 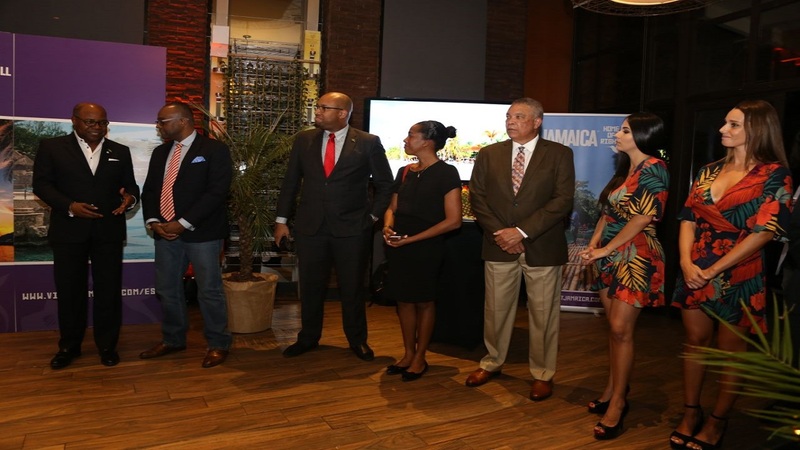 The announcement was made to large audiences of travel media, tour operators, airline executives and travel agents at the Jamaica Tourist Board (JTB)-organised receptions in Buenos Aires, Argentina and Santiago, Chile last week. “The move to daily service between Panama City, Copa’s major hub, and Montego Bay, our tourist capital, will make it easier for tourists visiting from several nations, including Argentina and Chile, which are among our most robust Latin American markets,” outlined Bartlett. “Now they can any day of the week, hop on a flight in Buenos Aires (Argentina’s capital) or Santiago (Chile’s capital) and connect seamlessly via Panama City, and be in Jamaica for quality vacation time. This is a game changer that will lift arrival numbers from this important part of South America,” Bartlett stated. The meeting was the first of a series of market engagements across several South American nations by the JTB with industry leaders as Bartlett’s team focuses on growing tourist traffic from Latin America, which recorded an over 16 per cent increase in stopover tourist arrivals last year. “Latin America is a very large market with a rapidly growing middle-class keen on travelling the world. Already we are seeing both strong interest and increased growth. Argentina specifically contributed approximately 5,000 visitors last year alone. With increasing airlift options and a more targeted programme of engagement by the JTB in this marketplace, I am confident that we will grow more significantly. 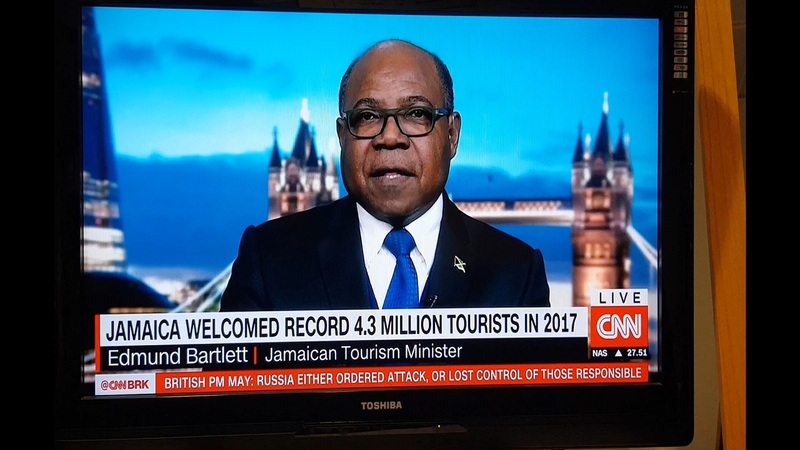 I have set a target aimed at doubling the number of Argentinean tourists coming into Jamaica from 5,000 to 10,000 by 2021,” Bartlett indicated. Meanwhile, Tourism Director, Donovan White, noted the importance of the added service, and pointed to the JTB’s aggressive approach to achieving more growth from several Latin American markets where growing middle classes and better airlift options are driving demand for leisure travel overseas. Transporting 13 million passengers annually and serving over 70 airports, Copa Airlines is the leading Latin American provider of passenger and air cargo services to countries in North, Central, South America and the Caribbean. Its hub is located at Tocumen International Airport in Panama City, and offers more destinations and frequencies than any other hub in Latin America, leading the way as the most connected airport in the region. Argentina and Chile amount for the bulk of tourist arrivals from Latin America into Jamaica, with approximately 10,000 tourists visiting from both nations last year. Limited cost-effective and seamless air connectivity is seen as a major hindrance to attracting more tourists from South America to Jamaica. White, Senior Advisor/Strategist to Minister Bartlett, Delano Seiveright, and other Ministry and JTB officials form part of the tour across South America that will take the team across Argentina, Chile, Peru and Colombia. Engagements include meetings with the leadership of Latin America’s largest airlines, including COPA, LATAM and Avianca; the larger tour operators; leaders of travel-focused TV, Radio, print and online media; Government officials and influential travel agents.